On April 10, 2018 at 15-00 in the literary lounge of the Central city library (22, Irtysh Embankment named after Slavsky) in the framework of realization of the Program article «Болашаққа бағдар: Рухани жаңғыру» the meeting with the winner of the national project «100 new faces of Kazakhstan» Valentin Alifanov will be held. Valentin Alifanov - the teacher of theatrical art of CSCI «Children's art school of Ust -Talovka village». The children of this theatrics collective will be the guests of the Central city library. 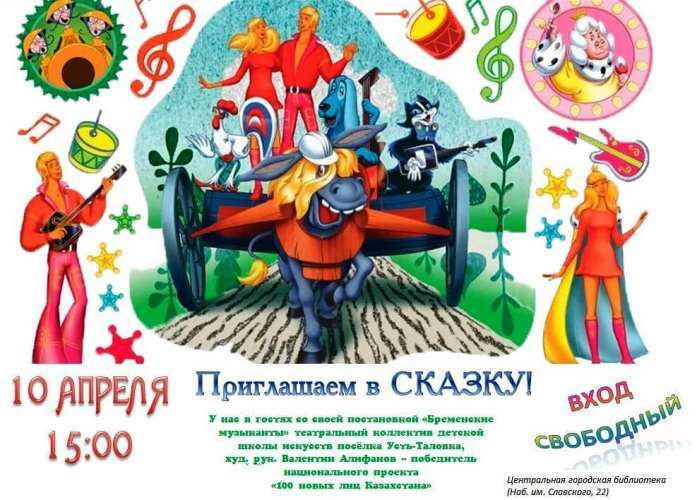 They will show «The Bremen musicians», staging by the leader and stage director V. Alifanov. Everyone is invited!